Seafood paella. Check out the color on that tuna. Eight-month-old children have a tendency to act like eight-month-old children. It was easier taking The Baby out with us on Friday nights when she was younger. Trips to Panera Bread, the Coppertop Tavern or Angotti’s were easy enough when timed just right. She would nap or otherwise be cute, but in a way that we could eat and not lose control of the table. At eight months, that freedom goes away. The Baby is pretty well-mannered, but she has an earlier bedtime than most senior citizens. The “going to bed process” typically commences between 6 and 6:30 p.m. each night. So, going out for dinner has become a rare option for two people who used to savor evenings where other people would cook. Since The Baby emerged, we have done three four “date night” dinners — Elderberry Pond (for my birthday in August), bc Restaurant and Koto Steakhouse (host for two of them). Friday brought a new entry…Moro’s Table. And it wasn’t just new to us…the restaurant opened during Summer 2010. I’ve been trying to find the words that describe Moro’s. The menu is eclectic. The food is on the cusp of fine dining. The atmosphere is casual but intimate. Our waiter was socially awkward. The parking lot was unplowed (like a snow shovel would have killed someone?). Overall, the meal was very good. The high notes were huge…sky high. There was one down point, but it wasn’t enough to overshadow the meal. The menu is American bistro with Asian and French influences. A limited sushi menu of about a dozen rolls and sashimi choices top the menu, as do a selection of salads and appetizers. The salad Lyonnaise looked intriguing, if only because a fried egg on a bed of lettuce just sounds good. A section of mussels included five different preparations. The table next to us opted in and received a hulking bowl of the shellfish, which certainly looked like it was worth the $9 price tag. The wife had a salad with ginger-miso dressing. I started with the featured soup — tomato fennel garnished with a sambuca creme fraiche. The waiter, who had zero people skills, advertised the soup as spicy. There was a boldness to the flavor, but it wasn’t exactly spicy. There was a smokiness to it, almost tasting like the tomatoes were roasted prior to being pureed into the soup. The sambuca provided a subtle bite and balanced the coolness from the creme fraiche. Entrees are served in small and large sizes, allowing for a shared plates of roasted chicken, grilled skirt steak, braised lamb shank and sauteed duck breast, among others. 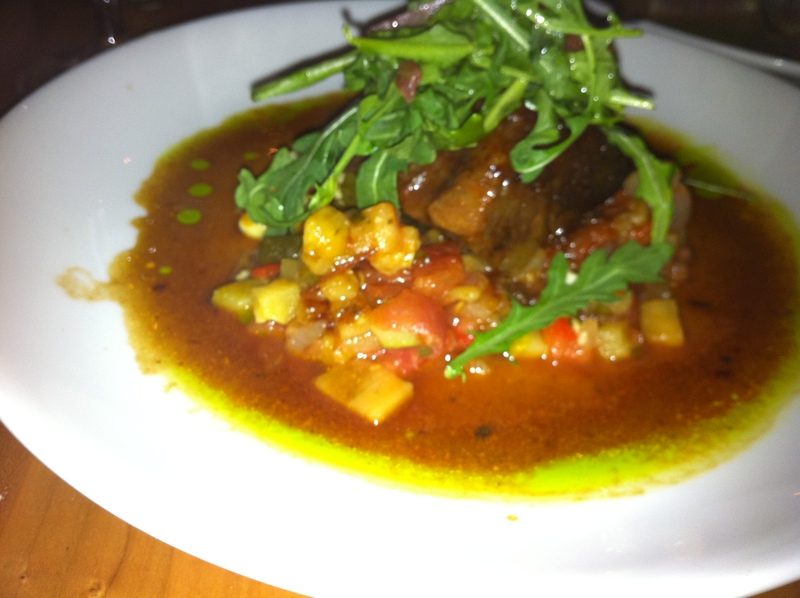 We opted for a trio of smalls — braised boneless short ribs, shrimp risotto and seafood paella. The short rib was the star of the night. The meat had absolutely no exposed fat and split with a fork. The flavor in the meat stood out, which is surprising with no fat or bone. The presentation of the meat led me to believe that either the bone was removed prior to cooking or the kitchen staff is extremely skilled at boning meat and making it look whole again. It was served with a creamy polenta and sauteed vegetables in a red-wine reduction from the braising. The paella was a nice variation on the Spanish rice dish. 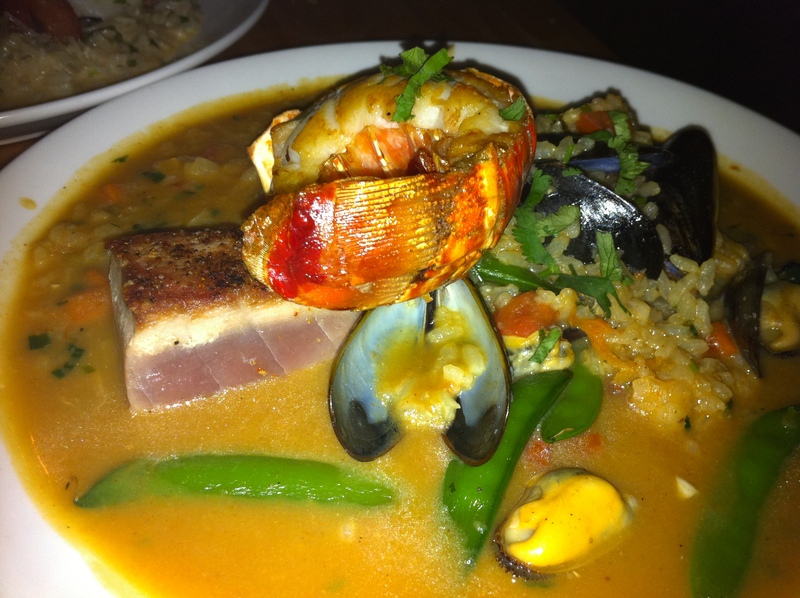 Rather than the traditional squid, shrimp and chicken base, this featured a perfectly seared ahi tuna, cod, shrimp and a small lobster tail, mixed with string beans, tomatoes and reduced in a saffron-tomato broth. The broth base was really tasty, to the point that The Wife and I were digging into it afterwards with spoons to slurp up the remainder. 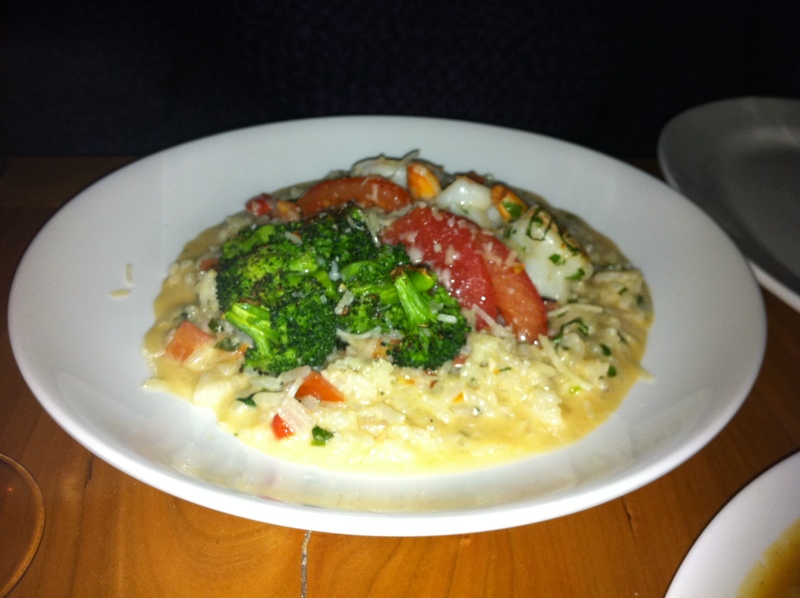 If there was a letdown for me, it was the shrimp risotto. The shrimp were tasty and the melted tomatoes had a really sharp flavor, but that’s where it ended. The sauce and rice were bland, while the added broccoli florets seemed like a steamed afterthought. Once you peeled away the shrimp and veggies, it tasted like rice steamed in creamy water. Dessert was a nice cap for the meal. We skipped the tableside French press, opting to invest our remaining stomach space in a pair of after-dinner favorites. The Wife had the warm chocolate cake — a petite, steaming hot chocolate cake paired with a caramelized banana bourbon ice cream — while I went with the creme brulee. Both were quite good…not remarkable, but I’m not sure how you make creme brulee more than just good (Flaming it tableside would be a safety issue and letting me use the torch brings up a whole other set of issues.). If I went back (and let’s face it, the chances of me going out to dinner anywhere in the near future is pretty slim), I would likely go with the short ribs straight up. I actually hated the idea of sharing it with The Wife, but since she was paying I figured that it was the least I could do. Contrary to popular belief, I am a giving person.